We were standing by the cars, at the end of a couple of hours’ walking, talking and guddling in the pools near Allonby, and one of the walkers had been showing us some objects that he had found previously. 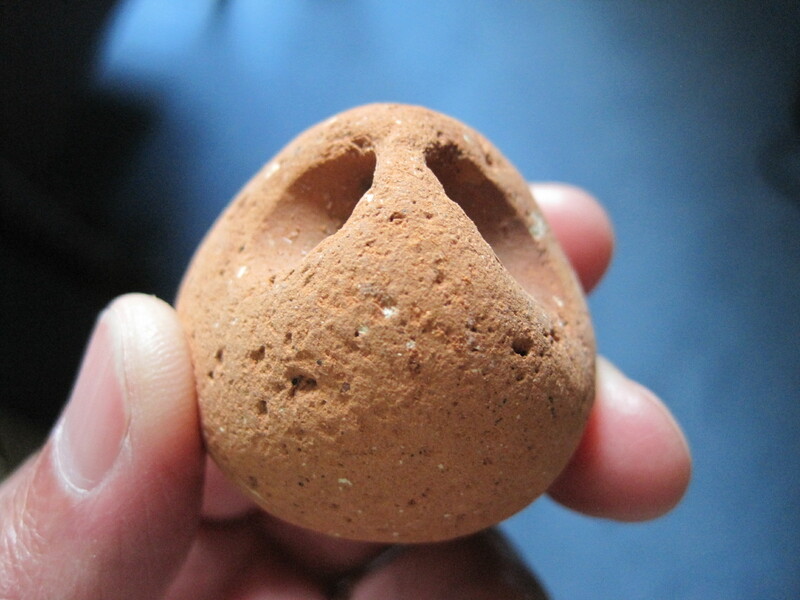 The loom-stone, made of rough red clay, was almost spherical but perforated by a hole. Apparently a friend of his had “more than a hundred”, collected over the years from the shore near Beckfoot. Not all were moulded from clay, some were smooth grey stone like Skiddaw slate, but all had a single perforation through which the warp would have been threaded and knotted, so as to hang tautly over the edge of the loom. Another suggestion is that some were weights for fishing-nets. Whatever their uses, they reportedly date from Roman times: there was a Roman cemetery at Beckfoot, and the army had encampments and milefortlets stretching down the coast from the western end of Hadrian’s Wall. I realised then that I too had a red clay loom-stone. Several years ago I collected smooth perforated stones from the shore so that I could suspend them from driftwood twigs to make a ‘mobile’. Of course it was not very mobile, and my daughter suggested that the corner of the room beneath it should be designated a ‘hard-hat area’ . But one of the stones was made of red clay. Recent storms have uncovered several patches of that same clay, perhaps derived from finely-ground red sandstone, with a texture that is markedly different from the smooth, grey, heart-stoppingly slippery clay that is occasionally exposed beneath the peat deposits on the shore. 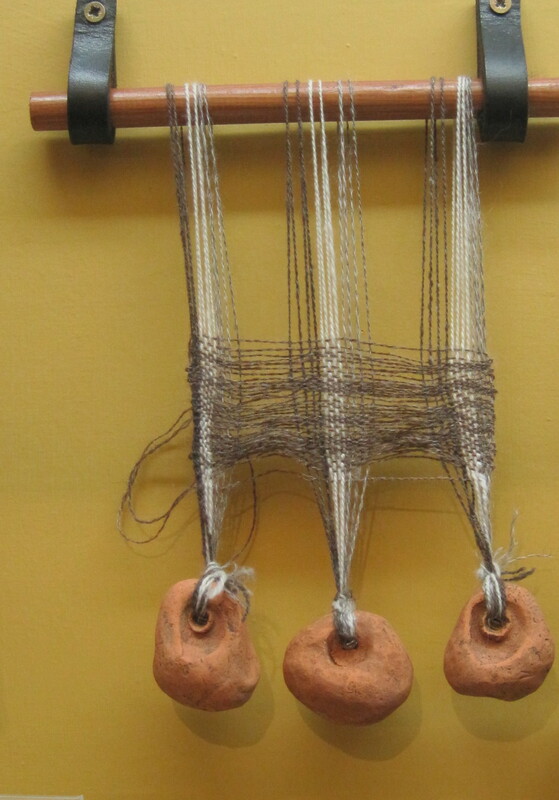 My own loom-stone is not large – its diameter is about 35mm and it weighs about 40 gms. It rolls comfortably between my palms. I imagined Roman children scraping at the damp clay, squeezing its clammy roughness in their hands, patting it into balls, poking them with sticks to make a hole; their hands and faces smeared with terracotta streaks. 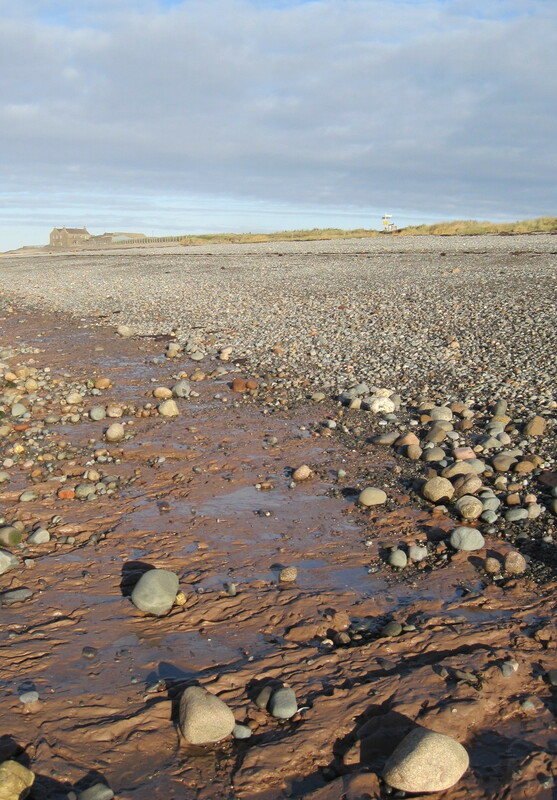 Lines of stones stretch out into the Firth from the Beckfoot and Mawbray sands. When I was looking at the mussel-beds a few years ago with Dr Jane Lancaster (who is now Senior Marine Ecologist with NaturalPower) we puzzled about the lines: where the rows were roughly parallel, perhaps the stones had been cleared to make a safe place to haul up a boat; perhaps they were the remains of fish-traps. 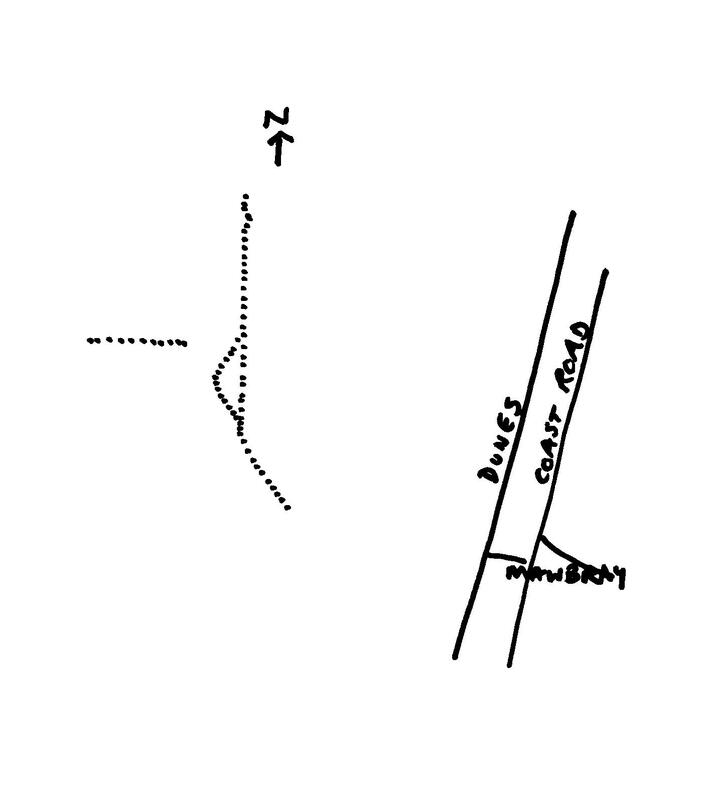 Jane sent photos to some archaeological colleagues, who suggested the lines might mark parish boundaries. 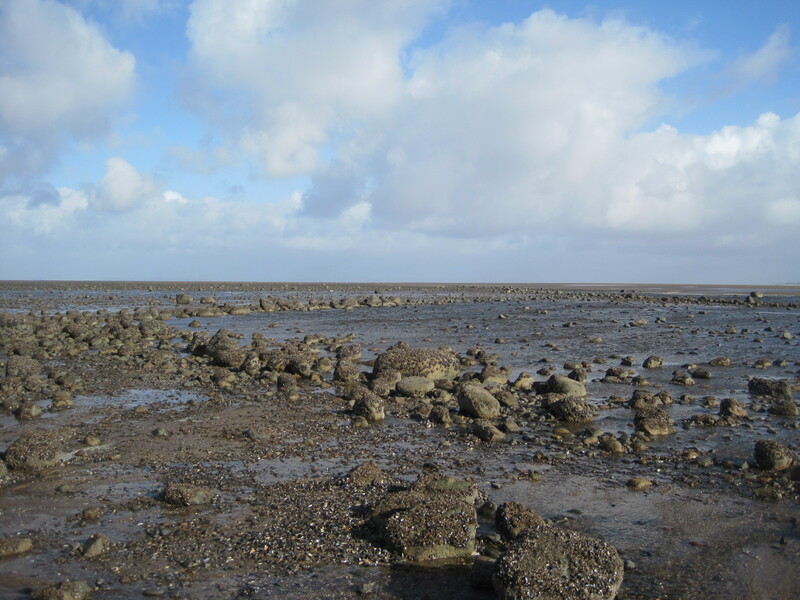 Another possibility was that they were boundary-markers for collecting cockles or mussels. 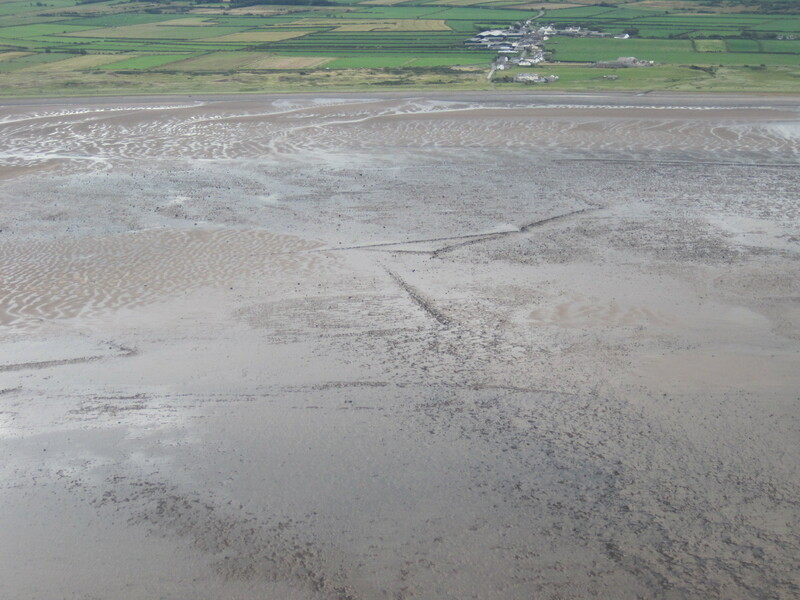 But a couple of weeks ago she sent me some photographs of aerial surveys (* see September update with new photos below) which had, unusually, been taken when the tide was very low, and these showed a line stretching out into the Solway from Mawbray. There is an abrupt corner where the line, which had been pointing across the Firth to Criffel, swerves North, and there a triangular ‘enclosure’ is visible. I went down to Mawbray today at low tide: it was a bright morning, but the wind was eye-wateringly cold. The shore has been re-modelled by the January storms so that comforting landmarks are no longer there; sand, that once hid much of the rocky, pebbly mid-shore, has been sluiced away and moulded into domes and hollows. Stones, each formerly a little ecosystem of adherent organisms and weed, are bright with the tatters of mussel-shells and broken barnacles. But the pattern of stones seen in the aerial photo is easy to find, and today there was water pooled inside the ‘triangle’ and trapped by the elbow of the corner. Could this indeed have been a fish-trap, for plaice, perhaps, or codling? It must have required considerable effort, and good knowledge of the tides, to drag stones into these patterns on the lower shore. Who made them; when, and why? 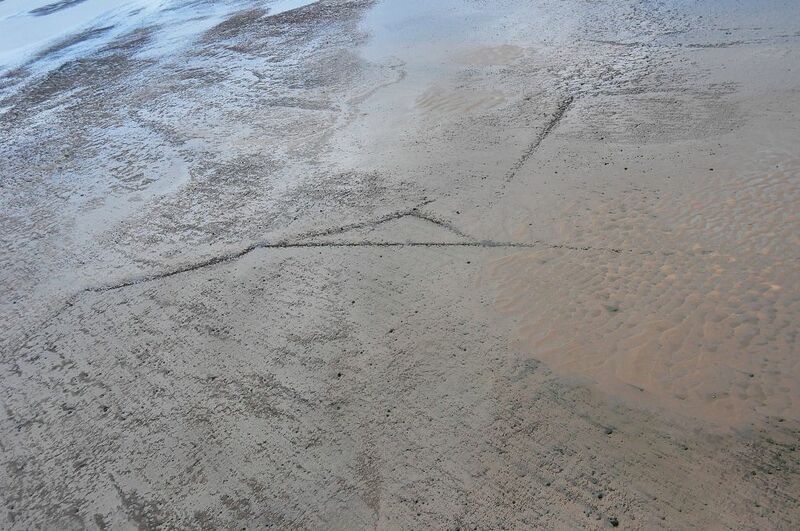 On my second gyroplane flight along the coast, at Extreme Low Water Spring tide on Sept 2nd, we deliberately flew over the lines of stones – straight lines, parts of rectangles, and the triangle. 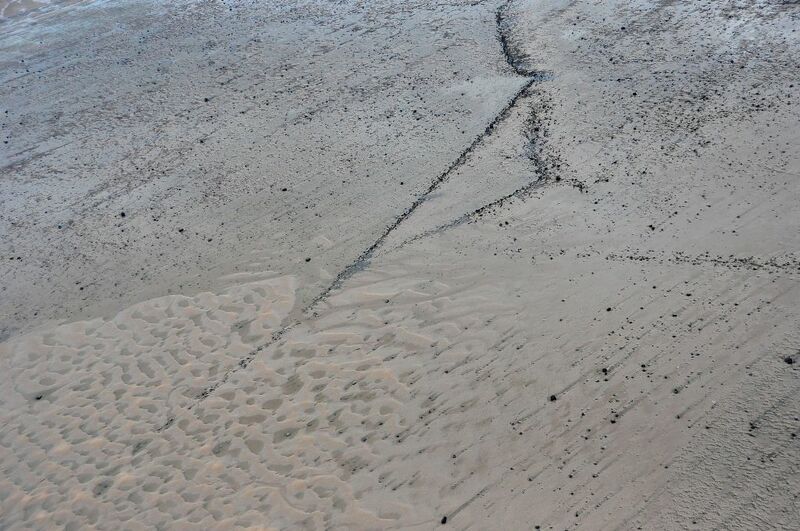 From their arrangement relative to the incoming tidal flow, and the patterns of the sand mega-ripples, it seems very likely that they were indeed fish-traps. This entry was posted in coastal heritage, fishing, stones, tidelines and tagged boundary-stones, fish-trap, gyroplane, loom-stone, Romans, Solway. Bookmark the permalink. Hi, we have similar fish traps near my work place- at Greyabbey Bay in Co Down in NI. They are linked to local cistercian abbey which was founded by monks from Holme Abbey near your place. 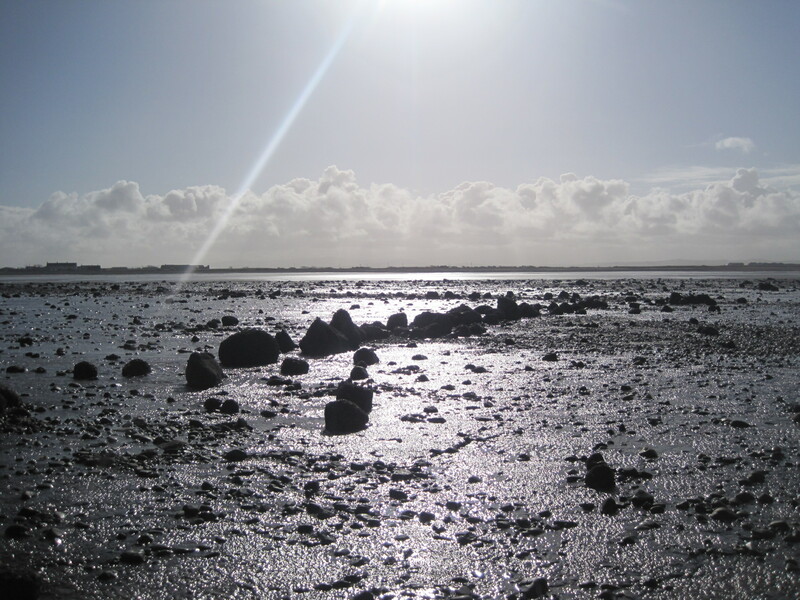 Stone fish traps appear in Northern ireland always in connection with abbeys founded in anglo-norman ‘time’. We have also older wooden traps which are dated for time pre norman conquest and some of them are directly under stone traps what help dating the stone ones. If you want some photos- check google map or contact me.